Successful genealogical research is based upon people helping people. Our volunteers unselfishly provide information available in their area to those who live far away. Several Dutch volunteers - including myself - happily look up records for you in Holland. 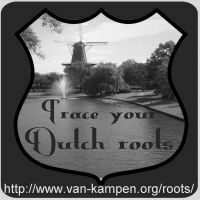 If you have Dutch ancestors and need records from Holland, please visit the RAOGK website, read the Frequently Asked Questions page, check if someone covers the area you're interested in, and make a request. If at all possible, return the favour by registering as a volunteer for your own area.